I’ve used tamarind paste for southeast Asian and Indian cooking. (See more info on cooking with tamarind here.) I like its unique, tart taste and, although I try periodically, it is too strong and too sour [for my taste] to eat raw. So when I discovered candied whole tamarind (sold as “sweet and sour tamarind”), I was very eager to try it. I love the naturalness of this chewy, not-so-sweet candy, because it only contains 3 ingredients: tamarind fruit, sugar, and salt. It’s perfect for people with a lot of food allergies or restrictions. The acquired taste of the tamarind is subdued in this candy, so it’s a great way to introduce someone to this fruit. Just be sure not to bite into the rock hard seeds. Luckily, they are large and easy to spot in this pod-like fruit. 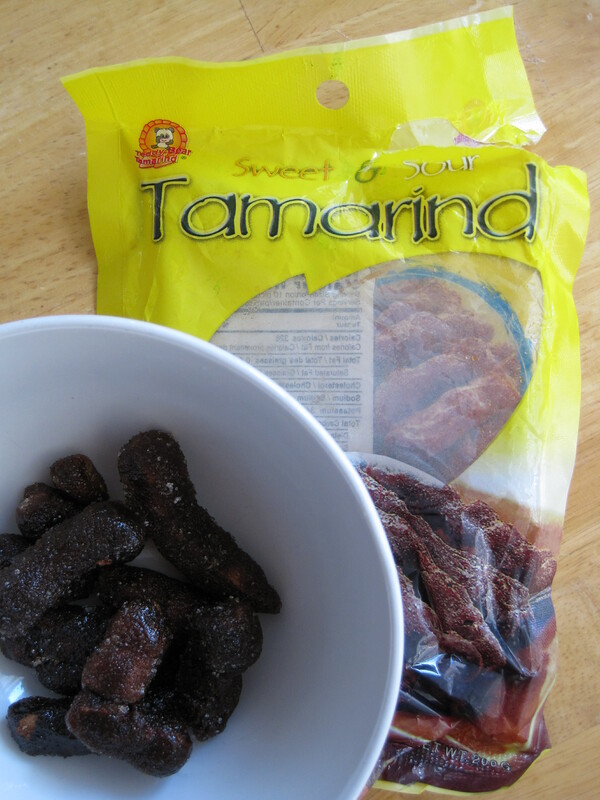 Note that the candied whole tamarind (shell removed) is not the same thing as the more commonly available, chewy balls of tamarind candy that are made with tamarind juice, sugar, and water. I prefer candied whole tamarind because it is lower in sugar content and processed more naturally. Unfortunately, it seems to be impossible to find fresh tamarind where I live. So for now, I’ll resort to buying the store bought candy. Di u have a recipe to share? I wish I did! I’m not able to buy fresh whole tamarind where I live. I tried making the balls of tamarind candy once, but I couldn’t get it to set. I’ll let you know if I ever figure it out! Thanks so much for your comment! I saw Tamarind concentrate at a client’s home I am curious about it never use it before. Can give me an idea how to use it. In what kind of food and drink I can use it and how do I use it. Thank you.